The Hawks Nest trail is located in the southern section of the Sonoran Preserve in Phoenix, Arizona. When beginning at the Desert Vista trailhead the Hawks Nest is the starting point for all of the other trails in the southern section of the Preserve. 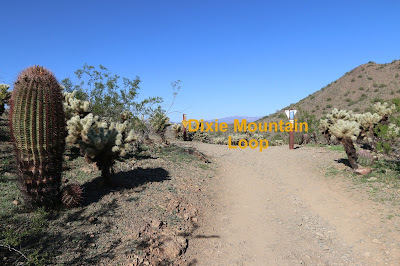 From the trailhead it climbs a moderate but rocky route that leads up to the saddle of a ridge where it connects to the Dixie Mountain Loop. About halfway up the hill it passes the spot where the Desert Tortoise trail branches off on the right. All but the last few hundred yards of the trail are visible up ahead as the Hawks Nest trail leaves the parking area. The trail starts out climbing at a gentle rate. As it gets further away from the trailhead it begins getting steeper and rockier at the same time. A few rocky outcrops come up that provide an additional challenge for mountain bikers. Halfway up the mountain, at the 0.2 mile point from the trailhead, the Desert Tortoise trail branches off on the right. As the trail continues it has short stretches where it levels off a little that are followed by short stretches that once again get steeper. The spots that are more level provide just enough of a break for catching your breath if you are on a mountain bike. The Hawks Nest trail comes to a quick end as it tops out at the saddle in the ridge where the Dixie Mountain Loop takes off in both directions. It is 3.8 miles around the Dixie Mountain Loop but there are several other options where you can combine parts of it with some of the other trails for a longer or shorter excursion. 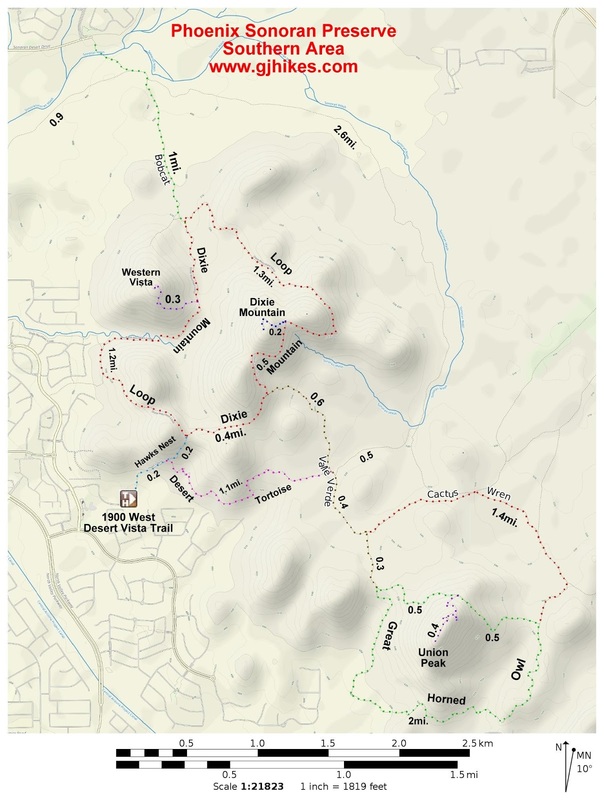 One option is to make a loop out of the Hawks Nest trail, 0.4 miles of the Dixie Mountain Loop, 0.6 miles of Valle Verde, and the 1.1 mile long Desert Tortoise trail for a round trip distance from the trailhead of 2.7 miles. 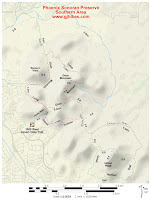 Making use of a map and the trail markers that occur every quarter mile or so it is easy to find just the right route to fit your needs. If you would like to see it for yourself then all you have to do is 'Take a hike'.